After eating an English muffin with peanut butter every morning for a year, I decided it was time to switch things up a little bit. I was looking to increase my fiber intake, and I figured breakfast was probably one of the easier places to sneak it in. One dish that immediately came to mind was oatmeal. However, oatmeal has never really been that filling for me, unless I add a bunch of other ingredients that are high in protein and in fiber. And then there’s the texture issue. Hot oatmeal is OK, but not something I regularly crave like my English muffin smothered in creamy peanut butter. I wanted a filling oatmeal breakfast that I could make the night before, and have it ready to grab and go the next morning. Enter in these chocolate overnight oats. There are a lot of great ideas on the internet, but the way in which they are made is expensive! Many recipes call for maple syrup or honey in place of other sugars, and they also call for vanilla extract. After making overnight oats for about a month, I went through an entire bottle of vanilla extract. And the brand I use is not cheap. Thinking there had to be a better way, I came up with an easier (and MUCH cheaper!) way to make chocolate overnight oats while retaining the same taste. 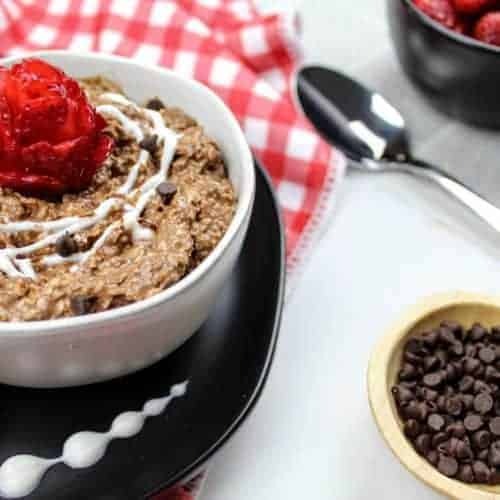 These chocolate overnight oats are made in less than 5 minutes once you get the process down, and they are ready to grab-and-go for breakfast the next morning. 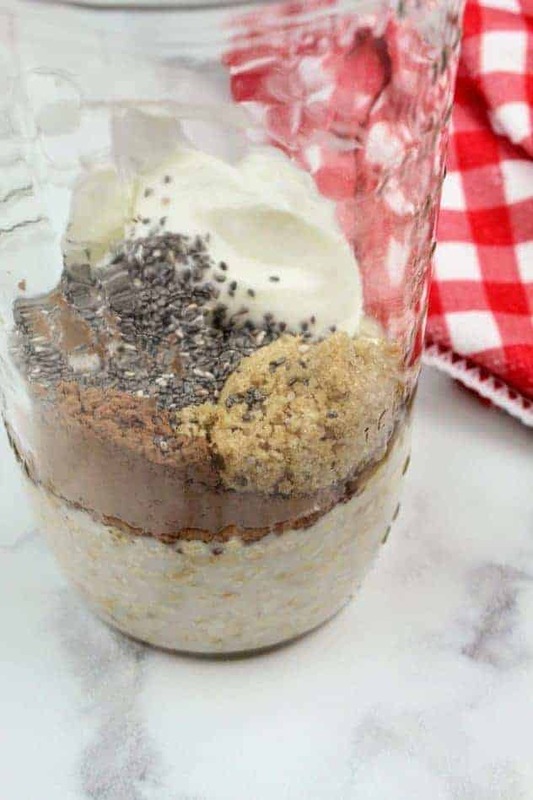 These chocolate overnight oats make it easy to eat healthy, without sacrificing your time or your money. A #winning combination! Overnight oats are traditionally eaten cold. However, as there is no right way to eat overnight oats, you can eat them hot or cold, depending on your taste preferences. To eat them hot, transfer the overnight oats to a microwave safe container and heat them up in the microwave or on the stove top. How do I add protein to overnight oats? There are several different ways to add protein to overnight oats. 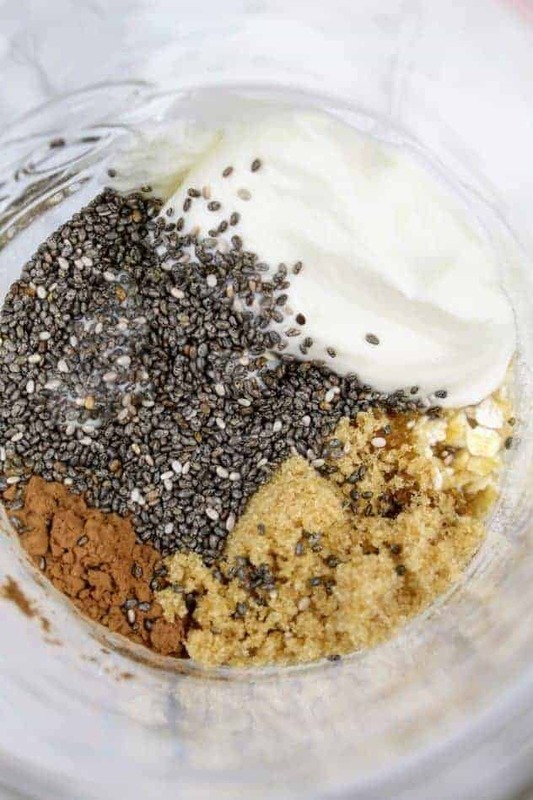 Some options include chia seeds, ground (or milled) flax seeds, whole milk, Greek yogurt, peanut butter, protein powder, nuts, and seeds. Which options are best will depend on the flavor profile of your overnight oats. Feel free to experiment! In my opinion, I only like them within two days of making them. Otherwise, they are too soft and mushy for me. Most online sources say they last up to 5 days in the refrigerator. Again, how long they last will depend on your taste and texture preferences. YES. Very healthy! Now, this version of chocolate overnight oats does have added sugar in it, from the Greek vanilla yogurt and the brown sugar. 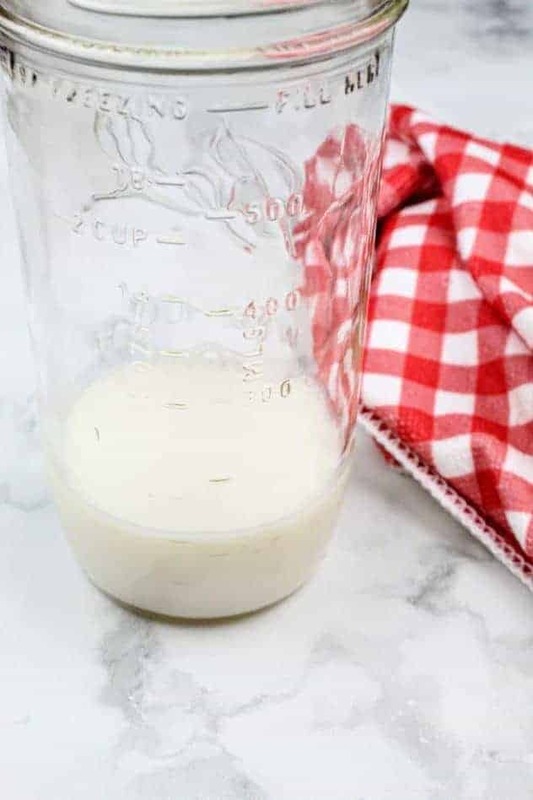 If you prefer to have less sugar, you can certainly remove the added sugar entirely and change the yogurt source (just make sure it has vanilla extract in the ingredients list!). Overnight oats have a lot of protein and fiber, which will keep you full until lunch time. I usually can’t even get through my whole overnight oats breakfast because it is so filling! Overnight oats can also be easily tailored to those on a gluten-free, dairy-free, or vegan diet, making them very versatile. 1. The easiest way to make overnight oats is in a 500 mL (or 16 oz) mason jar with measurement markings on the side. This makes it so that you don’t have to measure out the milk with a measuring cup (one less dish to clean, yay!). Using the measurement markings, pour in 1/2 cup of any milk of your choice. I like to use unsweetened almond milk. For more protein, you can choose cow’s milk, pea milk, soy milk, or the silk protein milk. Use a regular spoon to measure out roughly 1-1.5 tablespoons of cocoa powder. Dump that into the jar. Open a 5.3 oz. container of Greek vanilla yogurt and using your spoon, scoop out roughly 1/3 of it and dump it into the jar. Scoop out the remaining yogurt and store in a smaller mason jar in the refrigerator for future batches. Next, I just take my storage jar of brown sugar and pour about a teaspoon’s worth into the jar. 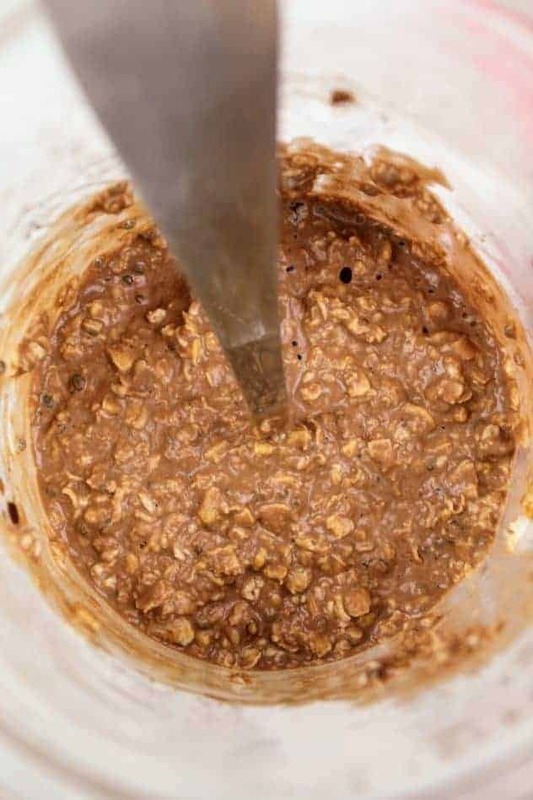 For the quick oats, I keep a 1/2 cup measuring cup in the container at all times, and I use that to measure out the quick oats and dump those into the jar. Finally, for the chia seeds, I keep a 1/2 tablespoon in the package and use that to measure them out and dump them into the jar. This way, you are only dirtying the dishes that you are going to eat from :). Clever huh?! This will help with compliance :). Also, when choosing a vanilla Greek yogurt, you want to find one that is high in protein (>10g per serving) and has vanilla extract listed as an ingredient. Don’t settle for ‘natural vanilla flavor’ and its derivatives. I personally use the Chobani Greek Yogurt with Vanilla. It even comes in a four pack at my local grocery store for additional cost savings. 3. Using a spoon, mix everything together. It will look soupy, but that is ok! It will firm up overnight. Now, because the mason jar is tall, you can actually leave the spoon in there, partially screw on the cap and stick it in the fridge. Ta da! Your breakfast is ready to go, with the spoon already included! 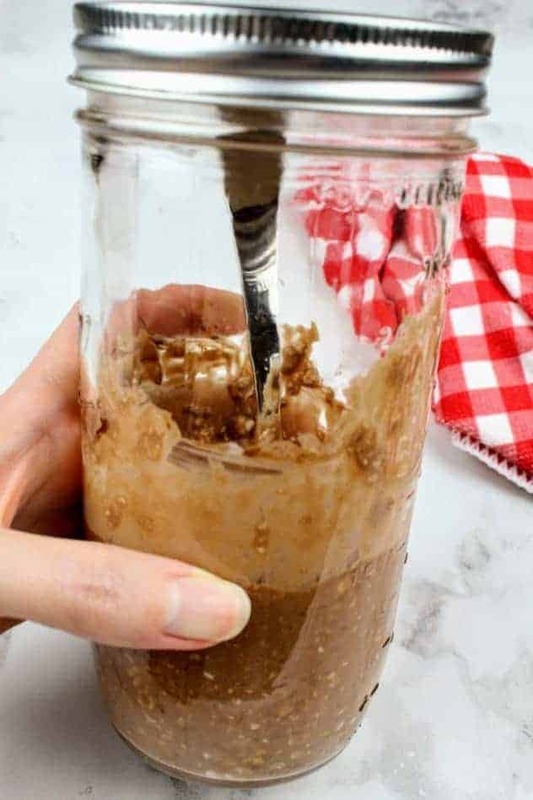 These chocolate overnight oats contain only 6 ingredients, and come together in 5 minutes or less. You prepare them the night before, so you have a healthy breakfast ready for the next morning! 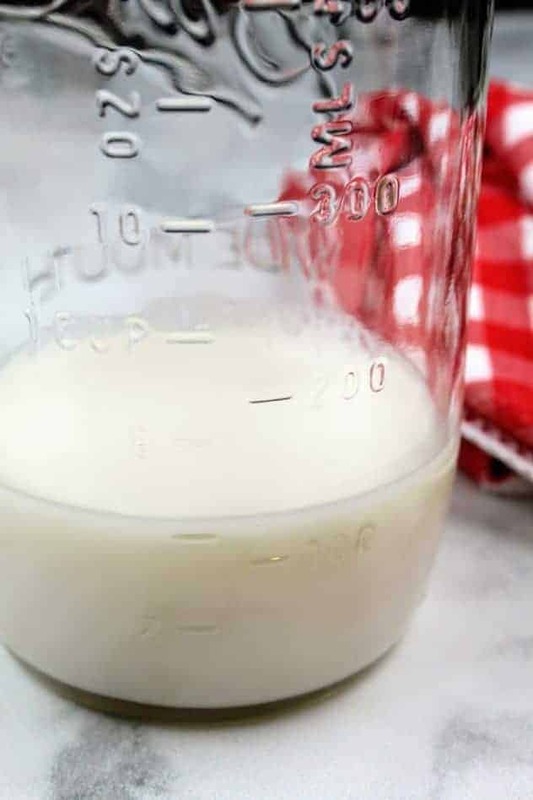 In a 16 oz mason jar, add milk of your choice. Following the method outlined above to minimize the number of dishes, add yogurt, cocoa powder, light brown sugar, oats, and chia seeds. With the spoon you are going to eat with, stir until every thing is combined and the chia seeds are uniformly distributed. Leave the spoon in the jar, and secure with a lid. Stick in the refrigerator overnight to let it set. Garnish with desired toppings such as berries, bananas, a dollop of yogurt, chocolate chips, etc. Enjoy! Gluten-free: Make sure your quick oats are certified gluten-free. These can be hard to find. I will have to make this. It looks totally delicious and nutritious as well. My family and I are always rushing in the morning. Love that I can make this the night before. These sound so yummy and a great fast breakfast option, too! I have been wanting to try overnight oats for awhile but never got around to it. 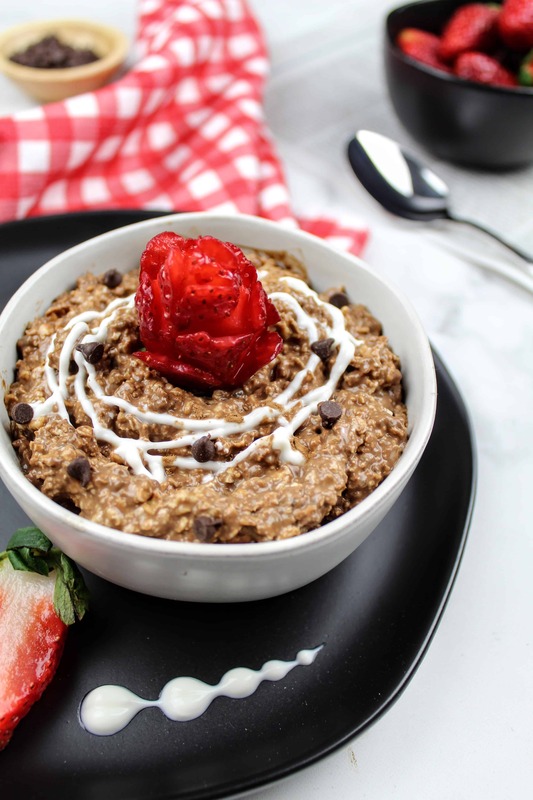 This chocolate overnight oats recipe looks and sounds so good! I especially like that you’ve included chia seeds, which are so healthy for you. I am going to share that recipe with my daughter. She is the baker of the family, she loves oat and chocolate. Oh my! This is so tempting! I really love eating oats and this oats was amazing with the unique twist! I love the idea! Yummy! Well I’m sure I would enjoy. I like all the ingredients. Have to add this to my list of things to try!